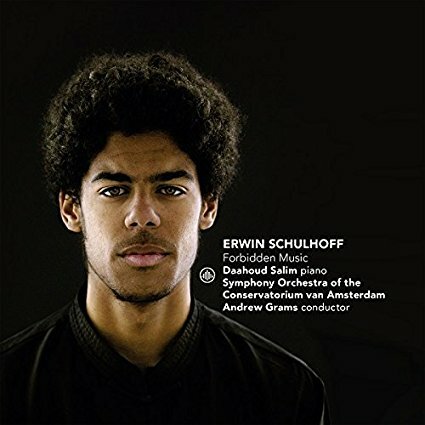 Challenge Classics International, a Netherlands based label, recently released this disc featuring the early piano works of Erwin Schulhoff (1894-1942). The Czech-born composer of German heritage was himself a gifted pianist who performed internationally. When Schulhoff relocated to Berlin in early 1922, he was introduced to American ragtime, dance and jazz music through the record collection of his friend George Grosz, an artist affiliated with the Berlin Dada group. This decade was extremely prolific for Schulhoff, who wrote many successful works synthesizing jazz and classical music, four of which are featured on Forbidden Music. The album’s title denotes the increasingly tenuous place of jazz in Germany by the late 1930s, which was one of the vilified genres designated by the Nazi party as “Entartete Musik” (degenerate music). Tragically, as a communist of Jewish heritage, Schulhoff was deported to a concentration camp in Bavaria, where he died in 1942. His music, considered unfashionable in the decades immediately following his death, has seen a much deserved revival over the last 20 years with numerous recordings of his works in print. Pianist Daahoud Salim is certainly up to the challenge of interpreting Schulhoff’s music. Initially trained by his father, American composer and jazz saxophonist Abdu Salim, Daahoud studied both jazz and classical piano at the Conservatorium van Amsterdam. 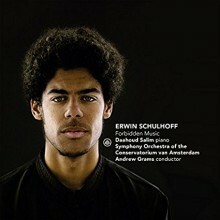 The album begins with a brilliant reading of Schulhoff’s complex Konzert für Klavier und Kleines Orchester, op. 43 (1923), featuring the Symphony Orchestra of the Conservatorium van Amsterdam led by Andrew Grams. The initial “Molto Sostenuto” movement flows into Salim’s rapturous piano cadenza in the “Sostenuto” section, then sweeps into the cinematic “Allegro alla Jazz” with full orchestra. This final movement is loosely scored ABA, with a mid-section interlude for violin and piano reminiscent of café music of the era. The remaining works, all for solo piano, allow Salim to display his brilliant technique. “Troisième Suite pour piano pour la main gauche” (1926) consists of five short movements that begin in a contemplative manner, gradually increasing in complexity through the third movement “Zingara,” before concluding in an intricate, rhythmically percussive finale. In Suite dansante en jazz (1931), each of the six short movements represent a different dance style: Stomp, Strait, Waltz, Tango, Slow, and Fox-Trot. The final movement sounds particularly “Gershwin-esque,” but overall this work holds up well and doesn’t sound overly dated. Salim performs with aplomb, bringing out the nuances of each dance style. He is joined by Russian pianist Nadezda Filippova for the closing work, Ironien op. 34, a six movement suite for piano four-hands that’s light-hearted and whimsical, with touches of Debussy and ragtime. Forbidden Music is a fine introduction to the classical side of Daahoud Salim, who is already making waves throughout Europe with his jazz quintet—they just released their debut recording to critical acclaim.